A California police officer who responded to an emergency call of a homeless pregnant woman has adopted her newborn daughter. 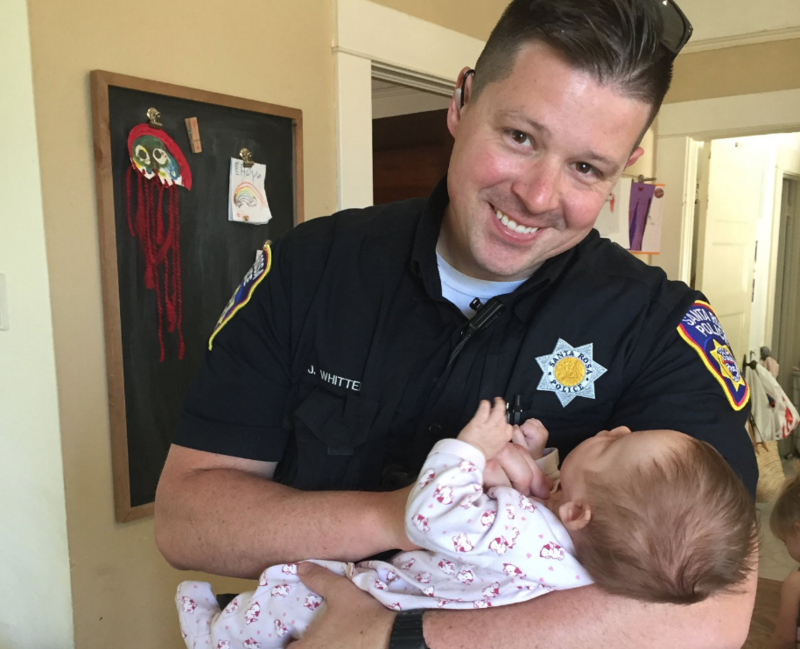 Officer Jesse Whitten, with the Santa Rosa Police Department, could never have imagined the impact a chance meeting with 6-month-old Harlow's mother would have on his life, CBS Francisco reports. The woman was living on the streets, pregnant and battling a drug addiction. While on patrol, Whitten would encounter her from time to time and check up on her, and on one such meeting last year in August, his wife, Ashley, was alongside. The two women struck up a conversation about motherhood and its challenges. "I mentioned, 'Oh, you are pregnant,' and she said, 'Oh yeah,' and placed my hand on her womb," Ashley said. At a Valentine's Day party, the Whittens got a call that would change their lives. The birth mother specifically asked for Ashley and Jesse to adopt her child. "It's weird to live in the tension of joy and heartbreak like this story is," Ashley said. "It's wonderful at the same time." Harlow Masie Whitten has blended in nicely with her three new sisters. "She smiles so beautifully," said Jesse. "Her smile is the best thing," Ashley added. Harlow was exposed to drugs in the womb and overcame obstacles in the first few weeks of life. She's doing much better now. It was just this week that Harlow's adoption became official. Last Friday, the Santa Rosa Police Department published a photo of Whitten and the newest member of the family. Ashley and Jesse have seen the birth mother since taking Harlow into their family. It was an emotional meeting. "We were talking and –– I was saying to her — 'You made this choice for her and that we are so grateful,'" Ashley said. "And she said — 'You're her mother now.'"